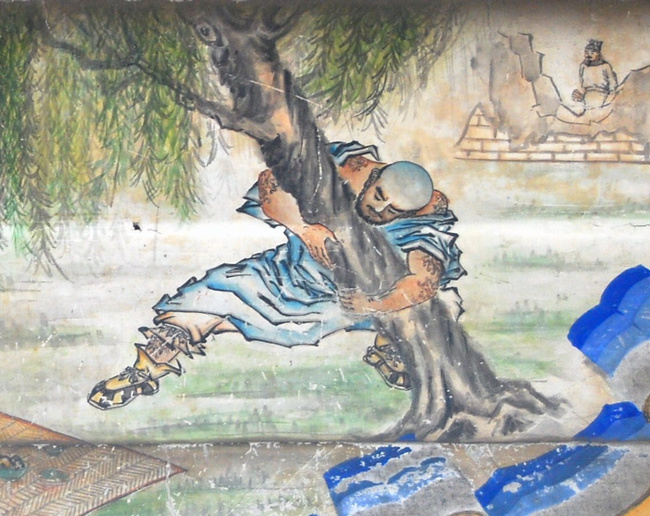 Legendary monk-outlaw Lu Zhishen uproots a willow tree. There is a contradiction at the heart of the Shaolin martial tradition, one that has irked devout Buddhists for centuries. The contradictions takes form in the person of the omnivorous martial monk, itinerant and outside of the pale, serving the state when needed and more interested in wine, property, and laughter than Zen meditation and self-cultivation. The very idea of a “warrior-monk” violates the first precept of the Buddhist faith, to do no violence against living things. Yet we still have the iconic image of the staff wielding bald pated monk in saffron robes, driving back bandits and foreigner invaders, absorbing crushing blows, and applying the feared “Buddha Palm” technique to deserving evildoers. While guzzling wine and chomping down on a leg of lamb. The origin of the “crazy monk” goes back to the very first monastery. That monk, the rebel who refused to obey and inspired others to follow in his footsteps—to the chagrin of the pious - has always been a part of the pantheon. His deity of choice is Vajrapani, the Buddhist guardian god with a flowered scepter in one hand, snarling face and bulging eyes, muscled chest exposed, standing atop the writhing bodies of demons and devils. Vajrapani is most likely a semi-tamed demon as well; the perfect patron for the disobedient fighting monk. The Shaolin Temple was never going to be a quiet place of monastic reflection. When the temple was first established in the shadow of Taoist predecessors, the city of Luoyang just an hour north was already the capital of a sprawling Buddhist empire. The somewhat mythical founder of the Shaolin Zen and martial tradition, Bodhidarma, is known to have visited Luoyang in the mid-6th century and the city was known far and wide for the golden domes of its hundreds of Buddhist temples, stretching as far as the eye could see. The emperor gave gold and property and protection to the Shaolin monks, who soon became a bit more than just the chanting, meditating faithful. Proximity to the capital required Shaolin monks to become astute politicians, economists, and managers of a growing estate. - Record of Buddhist Monasteries in Luoyang (547) from The Shaolin Monastery, by Meir Shahar. Lu Zhishen, a famous warrior-monk from the ancient classic, Water Margin. Before the monks ever engaged in actual recorded warfare, in 621 to aid the ascendant Tang emperor Li Shimin (Taizong), local officials and abbots were complaining about the “fake monks” and the “wild monks” who inhabited small clusters of dwellings outside of the temple. Eating meat and drinking and fighting, preaching their own brand of Buddhism free from the scriptures and the tight grip of old abbots and monastic rites. After the Tang Taizong Emperor gave land and protection to the temple in perpetuity, the wild monks grew only more uncontrollable. Stories and legends during the Tang dynasty (618 - 907) often combined the eating of meat, symbolic or otherwise, with martial monks. Breaking one of the most important rules of the Buddhist faith seemed to be a necessary step towards becoming the warrior the monastic order needed to protect it against bandits and robbers who wanted a piece of the vast wealth many temples and monasteries hoarded over time. Just as the demon Vajrapani became a loyal soldier and guardian of the Buddha, so too disobedient monks became the symbolic guardians and loyal soldiers of the monastic order and of course whomever happened to be the secular head of state at the time. But people love the wild monk. In fact, the wild itinerant monk holds a special place in Chinese Buddhist iconography, art, and folklore. The early Ming novel, The Water Margin, features the prototype fighting monk, Lu Zhishen. Lu drinks, eats meat, leaves his temple to wander the earth, and ends up hanging out with rebels and bandits in the swamps. A possible Western adaption of this story is Robin Hood and Little John, “jumping fences, dodging trees, trying to get away,” and their adventures in the forest of Nottingham. It’s not ironic that Little John uses a staff to battle his enemies. 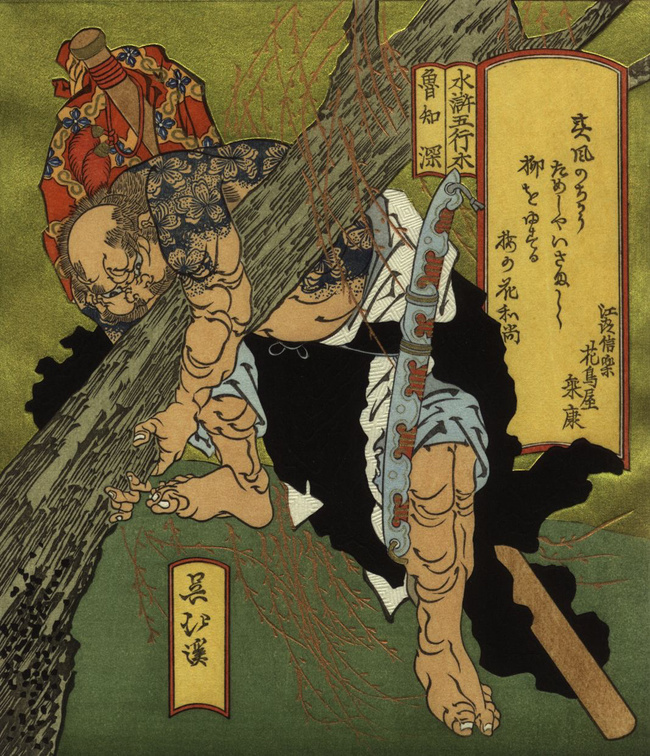 The staff is the weapon of the monk and the cleric - a blunt punishing weapon that spanks rather than slashes—and warrior monks across cultures have always preferred the simple stick to the sword. The idea of the disobedient fighting monk who nevertheless saves the day lives on today, in The Shaolin Temple starring a young Li Lianjie and also in the Journey of the Monkey King, coming out soon. Of course there are more serious monks at the core of the Shaolin tradition, monks who eschew rule breaking for the more esoteric goals of the original Buddha who found enlightenment under the banyan tree somewhere in India. But the crazy monks, drawn by the rich tapestry of life around them, unable to leave money and meat and conflict to the unrobed, are never going to disappear. Just take a look at the modern Shaolin temple, handling business and seeing millions of visitors a year, surrounded by the clustered buildings of warrior monks and their non-secular disciples. Seems like the wild monks may have taken over completely.